The barbell upright row primarily targets the front and side shoulder muscles, but it also works the biceps, rotator cuff muscles, and the lower and middle traps. Although an effective strength-training exercise, the barbell upright row is not the best option for some. If you experience shoulder pain or discomfort during the upright row, use the lateral raise as an alternative exercise. The barbell upright row can cause shoulder pain and weakness. Lifting your upper arm to the side while internally rotating your shoulder -- the movements which occur during the upright row -- increases your risk of shoulder impingement. This occurs when the tissue and fibrous bodies inside the shoulder joint become squeezed between the top of the upper arm bone and the bony protrusion on the end of the scapula as the arm bone rotates in the shoulder capsule. Shoulder impingement can cause pain, weakness and lack of functionality in the shoulder. Like the barbell upright row, the lateral raise involves shoulder abduction, or lifting your upper arm up and out to the side. But the lateral raise does not involve internal rotation, so your risk of shoulder injury is reduced. The muscles on the sides and fronts of the shoulder are the main movers during the lat raise, the same as during the upright row. To perform the lat raise, relax your arms by your sides with your palms facing your thighs. Set your elbows in a slight bend and hold them at this angle throughout the movement. Exhale and lift your arms out to the sides until they are parallel to the floor. Pause and slowly lower them back to the starting position. The lat raise is a single-joint exercise that only involves movement at the shoulder joint. The upright row is a multi-joint exercise that involves movement at the shoulder and elbows. The biceps are more involved during the upright row than they are during the lateral raise. The standard procedure for the upright row involves lifting the bar to your chin. Your upper arms finish at an angle above parallel to the floor, which activates the traps more. However, this excessive range of motion also increases your risk of shoulder impingement. The upright row is primarily a shoulder exercise, not a back exercise. If you include this exercise in your workout routine, limit the range of motion, as lifting your upper arms past parallel to the floor increases your risk of shoulder impingement and injury. If the upright row doesn't feel comfortable, use the lat raise as an alternative exercise. 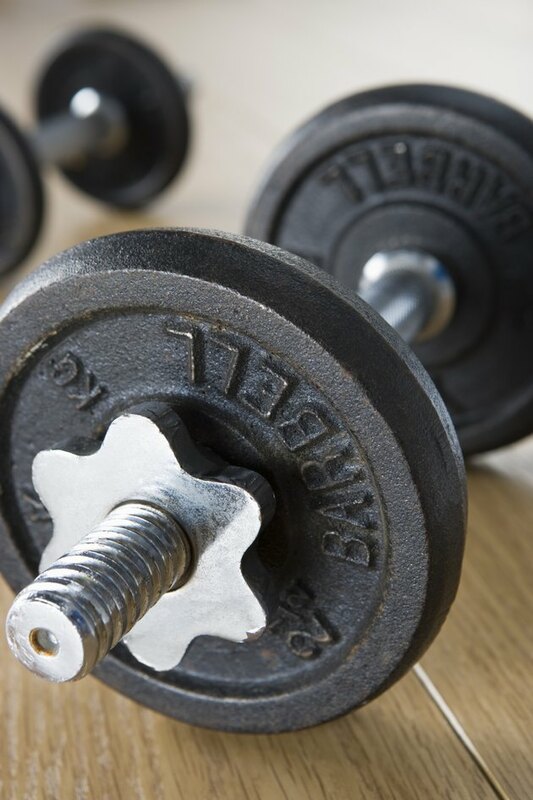 Does the Dumbbell Bench Put Less Stress on Your Shoulder Muscles?